Today we have the pleasure to interview one of our Reading with Your Kids Certified Great Read author on the podcast. Please welcome Joy Resor to the show! Joy is a children’s book author and the founder of JoyOnYourShoulders.com. In our exciting interview, she gladly shared with us, her mission to excite children about reading and to teach kids to love and accept themselves for who they are. She wrote her latest children’s book, “Designed to Shine! 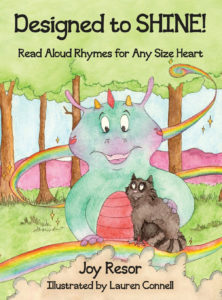 : Read-Aloud Rhymes for Any Size Heart”, to introduce the young children to the love of poetic verse. Open any page of Designed to SHINE! for a rhyme with art for your heart. Topics will lead you and your loved ones into fun, laughter, and joy…and onto the dance floor! You’ll receive ideas to pay attention in new ways, reminders about kindness and so much more in this alphabetical treasure. This is a book, a guide, and a gentle teacher all at once. It’s a book for you, your child or your inner child…about loving who we are to shine in the world. I’m grateful that I’ve healed into my given name of Joy after daily writing a prayer in my journal to be the Joy God created me to be. It is my honor and delight to be free from the blocks, worries, shame and more I carried around for years. Now, my loving, serene, joyful presence speaks volumes before I say a word, and wisdom I’m called to share is offered with ease, confidence and grace. I’m excited that these books, Go In Joy! An Alphabetical Adventure, Go In Joy! Venture to Your Center – Journaling Prompts to Enliven Your Joy and Designed to SHINE! Read Aloud Rhymes for Any Size Heart, that flowed through my heart and hands now are available through Amazon. May these creations inspire you to expand your joy and to more deeply love your life! I love my varied days writing, serving clients in spiritual direction, mailing books and joyful wares, leading a workshop, walking, laughing or being with friends. Where can you find Joy Resor on the internet? Where did Joy find the time and dedication to write this book? What kind of conversation families can have after reading this book? Some of the interesting facts about her book, exclusive sneak peek into her future projects and much more. Be sure to tune in to catch all the fun! Joy, you rule. Thanks for doing this interview, best of luck with your book! In case if you have missed, please be sure to check out our review of Designed to Shine! Read Next“Let’s Make Yoga Magic” with Heather Leah! !